The philosophy of Personal Development espoused and expounded within the pages of this Site is anchored in Natural Law. An academic definition of Natural Law does not suffice to corroborate such a philosophy. 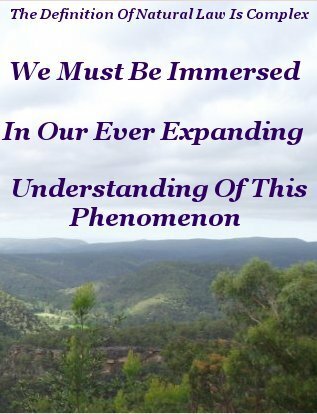 We should immerse ourselves in an ever expanding understanding of this phenomena that operates the Universe and everything it contains. Personal development is vitally concerned with Natural Law in general and it's relationship to Human nature and behavior in particular. Many a definition of Natural Law can be found from sources as diverse as Religion, Science, and Philosophy. Each discipline vying for supremacy. The irony that these three big entities, in the earliest quests for knowledge, driven by an increasing thirst to know powered by curiosity, were, at that time, closely integrated, should not be lost on the modern intellect. When these three entities reunite in a bond of compassionate Brother and Sisterhood, becoming one, and employ their collective brainpower in the pursuit of their original goal and purpose of discovery, we will experience a peace that at present appears to be unattainable. We are, thankfully, seeing albeit faint, signs of this. 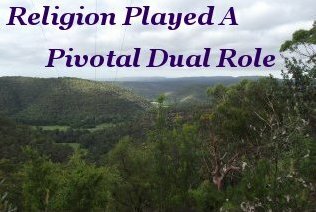 In those early euphoric days Philosophy and Science and Religion shared a common goal. That goal was to know. Subsequent to those tranquil early times of knowledge seeking and inquiry, Humans became increasingly plagued by and burdened with the disease of contention. Violating the Laws they sought to comprehend, the three entities gradually diverged, deviating from forming a common doctrine that all could share and benefit from. A doctrine of what is. Following escalating misunderstanding and disagreement, undiscerning, self centered minds splintered into sets and sects in a capricious demonstration of rank ignorance of employing the Laws of Nature. In particular, Natural Law and Human nature. In the midst of ignorance, the dark side of Human nature was permitted free reign. Dividing humanity into three groups. The selfish Power seeking dominators, Truth seeking Thinkers, and a sad cowed majority. Dominators harassed, intimidated, tormented, and violated those who resisted the dominators irrational beliefs, demonstrated sense and reason, or sought out knowledge, understanding and enlightenment. In other words, anyone who dared to seek a deeper definition of Natural Law. We fare a little better these days. Religion played a causative dual function in Humanities blemished history of knowledge seeking. At it's illustrious best religion was the catalyst for mind shaking discoveries. At it's worst it plunged Humanity into one thousand years of dictatorial darkness. It should be understood that intrinsically, religion, or any other discipline, is not what causes dissension and the resulting chaotic environments. It is uncomprehending and misguided minds within these disciplines, driven by greed, whose personal power seeking agendas tend to form cliques, cabals and factions. Useless for advancing what should be the common cause of cultivating Humanity to reach higher planes of existence, by developing a clear and comprehensive definition of Natural Law, these undesirable combinations of non thinkers hijack the trust and goodwill of uncomprehending followers. While at the same time they undermine the painstakingly earned progress made by enlightened minds within the same discipline. 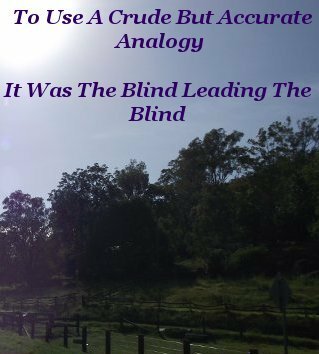 To coin a crude, accurate analogy, it was the violent blind leading the submissive blind. Despite remarkable progress in recent times, hijacking the trust of credulous followers is a condition that still prevails in some quarters today. A weakness that is excused as the Human Condition. Religion must bear it's share of responsibility for all the regressive injuries mindlessly inflicted on Humanities progress. Spiritual and Physical. Science and philosophy were - and still are - not without their incongruous members creating tumultuous environments. But the power seekers within religion exerted the greatest adverse influence on the truth seekers and the population at large. Confusion and conformity were the order of the day. Fast forward to the present and we still find a world confounded and in turmoil. A rough estimation suggests a little less than half the world's people live in political freedom. Even amongst these so called free people strife and acrimony appears rampant. No longer the exclusive domain of Religion, Science and Philosophy, Human discordance has spread far and wide. In a disturbing demonstration of the severe lack of comprehension of Natural Law. The dark side of life is not a pretty picture. But when you see, hear, or read about the multitudinous conflicts around the world, infecting the health of Human relations, reflect awhile on this contentious history. Note if you can perceive the solution to this self inflicted chaos the multiple participants in this chaos are creating. By their refusal to understand and implement Natural Law as related to Human nature. For their own, and others, benefit. Studying the cause and effect of Human strife is the best way to eventually get one's head around a wider definition of Natural Law in the context of Human behavior. Reality is a wizard teacher for a willing student. Much Human conflict, aside from the serious issue of the questionable desire to dominate, arises from segregating knowledge and elevating that fragment above all others, assigning it an importance that often creates a viewpoint that is then vigorously defended. There is definite justification for science and other fields to adopt specialization. Laws of Nature are so vast that it makes sense to reposition them into separate disciplines. However, we should retain the same integrated relationship of these disciplines that we find in the actual physical world. 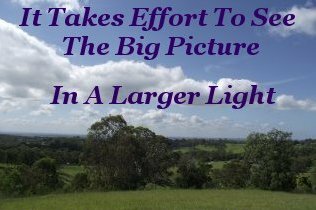 It takes active effort to comprehend the big picture. But one on the path of enlightenment accepts the challenge of deeper thinking to see things in a larger light. Philosophy too, should try reacquainting its diluted self with integration. We have a tendency to classify ourselves into narrowly defined segments of fixed quality and placidly accept these definitions as true and real. You are a Stoic, I am a Transcendentalist, for example. Paradoxically, that is exactly what happens. What we think and believe, we become. Anthropology, Psychology, and Metaphysics are just some of the parts of an integrated big picture. Today, won at enormous cost in Human and environmental suffering, we now have a competent understanding of the Laws of Physics and have put these Laws to mind-boggling use. If not always to the benefit of all. Personal freedom has invariably been threatened by, and been the victim of technology used in an unjust and evil manner. While physical violence is still an instrument of choice utilized by dominators in some so called third world Nations, its use has diminished substantially in the first world. Diminished only to be creepily superseded by an insidious danger that imperils every hard won Human right we possess. That very real insidious danger is psychological violence at the press of a button. In light of this ever present danger, implementing, as individuals, a healthy working knowledge of an expanded definition of Natural Law, to influence our behavior to reach ever higher planes of thought, should be our highest priority. Not to do so leaves each one of us susceptible to the whims and dictates of modern day would be dominators. 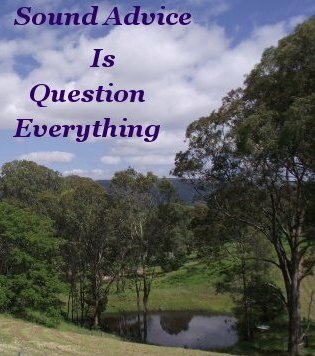 Sound advice to oneself here, is to keep in mind Albert Einstein’s exhortation, "Question everything". I am in absolute awe of Nature and Her inexorable law. 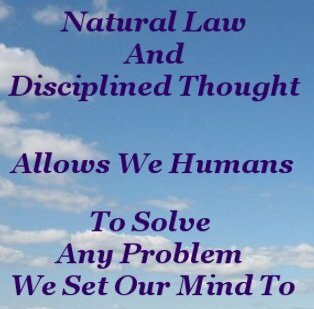 The downright practical quality of Natural Law combined with adequate disciplined Thought allows we Humans to solve any problem we set our mind to. Reaching the state of mind that permits and delivers peace and prosperity for every Human Being is our first, and greatest, challenge. This challenge is not going to be met by allowing our leaders to continue opposing each other, as is the current tradition. Our second greatest challenge is restoring our long suffering, overburdened physical environment. An environment that is struggling to support us under that uncaring burden. We can rise to these challenges with complete confidence when we grasp the actuality that the answer to both problems resides within the individual's, and by extension, our collective, lucid comprehension of an expanded definition of Natural Law. Nature delivers to us a direct and absolute message, loud and clear. Every Human Being is an equally important, interconnected part of that one entity. We ignore this message at our eventual peril. A Deeper Definition Of Natural Law Rocks!